Finally the major air gap that lurked just beneath the roof line has been enclosed and trimmed up. It's not air tight yet and needs sealing but the major 3.5 inch x 16 foot gaps are no longer open on the sides of the greenhouse. I'm not ready to open the champagne yet but I feel like a major weight has been lifted! I figured out how to remove the old rusted deadbolt from the front door. I drilled the heads off. It took some time but once the heads were removed the lock and screws came out easily. Now I can get the front door ready for use. The doors swing outward and soon I can replace the old lock with a different lock that can be keyed to match the other locks. 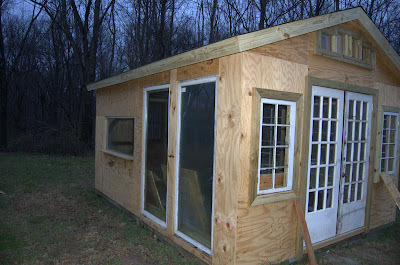 This side is where three large windows were converted from patio doors. I even rigged up a nice little shelf for small plants outside the window in the back. 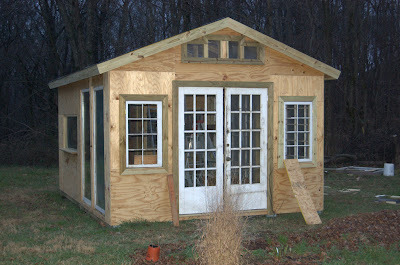 The two patio doors toward the front of the greenhouse still need sealed up around the cracks. We left some gaps intentionally so that they could be fit in easily and figured we would come back to caulk/weather strip later. One neat feature I'm working on is a secret door. Obviously it can't be that secret if I'm talking about it on the internet but it will be hidden from view most of the time. The door on the back opens easily without the wall-door opening on the right. I'm arranging the trim to go around the left door but freely open with the right wall-door. I'll do a post on it later once it's all put together. Here's the west side view. There won't be much siding to put on this side! 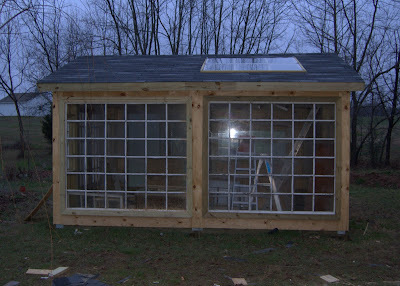 The almost 6'x7' windows will provide quite a bit of light for plant starting in the spring. I may need supplemental light since starting seeds in February can be a challenge when the sun doesn't shine. The windows in the roof are catching a good amount of afternoon sun which will help heat the greenhouse but won't necessarily provide extra light for the plants. All my early spring cuttings will do great in this setting! I can't wait to be done with the ladders you see inside the windows! 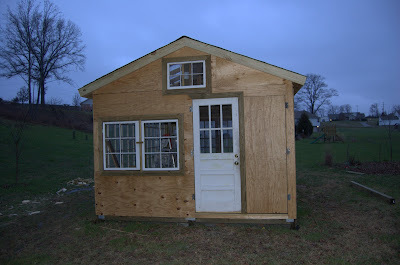 I'll still need them to do the siding and various parts of the inside but I'm getting there, one warm winter day at a time. Looks wonderful Dave!! You have certainly been dedicated to this project! Thanks Darla! I'm really hoping that my wife can park in the garage soon...it will be nice to have the mowers in their own house! Lookin' good, Dave!!! I love the secret door, too. And that wall of windows is just phenomenal. GREAT design, and great job!!!!! Looks awesome! love the hidden door!